Home / Love and Hip Hop ATL / You Won't Believe Who Erica Dixon Spent Valentine's Day With! You Won't Believe Who Erica Dixon Spent Valentine's Day With! Aww sookie sookie now! A couple of weeks ago, I had reported that Erica Dixon and her unemployed boyfriend Oshea Russell had broken up. I got real messy and even tweeted the blog post to Oshea and Erica, trying to get some kind of reaction out of either of them, but unfortunately they ignored my thirst antic *tears*. About a week after posting the story, Oshea had trekked his broke azz all the way from Virginia to Atlanta (in the snow) to try to reconcile with the Love & Hip Hop Atlanta star and I guess it worked because he ended up posting a picture of the two of them on his Instagram. I banged my head on my desk in defeat. How the hell they gonna try to prove me wrong? I was almost certain that Erica wasn't fukking with Oshea anymore, all the signs were there. She seriously hasn't posted a picture on her Instagram about him or with him in months! If that aint the tell-tale sign of the end of a relationship then I don't know what is! So Valentine's Day rolls around and this is the time of year when relationships are put to the test. I simply sat back and watched as Valentine's came and went without a lovey dovey peep from neither Erica nor Oshea. That was my first inkling that once again, Erica had came to her sense and slow punted the father of three from her life. Meanwhile, on the other side of town, Erica's ex-fiance Lil Scrappy and his new girlfriend Bambi have also been on the low low. They didn't spend Valentine's Day together and Bambi has deleted the pictures she took with Scrappy in the past month. So if Erica wasn't checking for Oshea on Valentine's Day and Lil' Scrappy wasn't massaging Bambi's gums on lover's day, then who the hayle was with who on February 14th??! I was shocked as hell when I saw this picture. Check it out! Oh mylanta! Do my eyes deceive me?! Erica hosted a party at club Onyx in Atlanta and guess who stopped by, her baby daddy and King Izniyeeee himself, Lil' Scrappy! Now, this can be a harmless meeting between two parents but I haven't seen these two pictured together since they ended their engagement. And the fact that their supposed significant others weren't present on one of the most important days of the year is very telling. This is about to get good y'all! 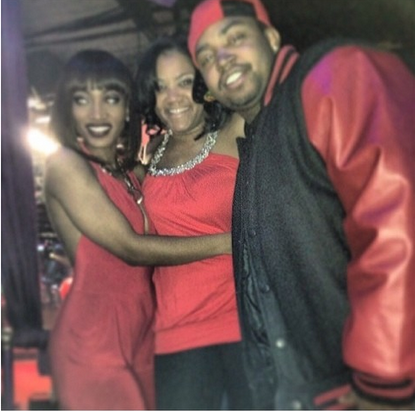 What do you think about Erica Dixon spending time with Lil Scrappy on Valentine's Day? Do you think the twosome will get back together? HA! I knew they would get back together sooner or later!! Yasssss...they need to get back together!!!! Yassssss!!!! !They need to get back together!!! Some of you must have forgot that Scrappy is a looser, he wasn't paying child support and treated Erica like crap. He's no better than O'shea but I think Erica should focus on herself and her daughter Emani.